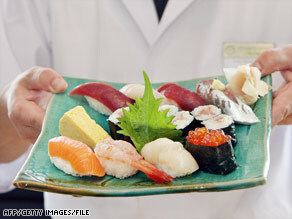 NEW YORK (CNN) -- Two teenage girls used DNA bar coding to determine that some sushi on New York dinner plates was mislabeled with cheaper fish being passed off as a more expensive species. Results show that half of the restaurants and six of 10 grocery stores sold items that were mislabeled. Kate Stoeckle and Louisa Strauss were not science majors or even college students when they decided to take 60 samples of seafood and use a genetic fingerprinting technique to see whether the fish were labeled correctly. The graduates of Manhattan's Trinity School in New York were inspired by Kate Stoeckle's father, Mark, a scientist and proponent of the use of DNA bar coding, a technique that greatly simplifies the process of identifying a species. "Growing up, bar coding was dinner conversation, so I was familiar with it," Stoeckle said. "And then one night, while out to dinner, I asked, could we barcode sushi? Louisa and I love sushi, and we thought, why not apply the bar coding technology to see what food we're eating?" After collecting samples from four restaurants and 10 grocery stores, spending about $300, the teens sent them to the University of Guelph in Ontario, Canada, where the Barcode of Life project began and where a graduate student had agreed to conduct the genetic analysis. The girls' samples were compared with the global library of 30,562 bar codes representing nearly 5,500 fish species. According to Mark Stoeckle, DNA is extracted chemically. The bar code gene, a chemical code, is amplified in a process called Polymerase Chain Reaction. A machine examines the DNA sequences called bases, which are a series of letters, A, G, C and T, and then digitally matches them with a library of DNA bar codes or other series of letters. The bar code itself is very long, with 648 letters. The results showed that 25 percent of the girls' samples were mislabeled: half of the restaurant samples and six out of 10 grocery store samples. In every case, less desirable or cheaper fish was substituted for its more expensive counterpart, Stoeckle said. She and her father would not divulge the names of vendors, citing a fear of lawsuits. "It's not the fishermen, and it might not even be the restaurants," she said. "Most likely, the mislabeling is occurring somewhere at the distribution level." For example, fish sold as white tuna turned out to be cheaper Mozambique tilapia, flying roe fish was replaced with smelt, and red snapper was mislabeled as Atlantic cod and Acadian redfish, an endangered species. "They are the first to do it," Mark Stoeckle said of the girls. "It's like 'CSI' for fish." He said the process could become as common as GPS. "Many people are working on miniaturizing it, bring the cost down and the speed to process up," he said. "Sequencing is a chemical process. There is no reason why we can't check the food on our plate [and] send the signal out to a database electronically. GPS used to be as big as refrigerators and only used by the government. Now it's a common application in a phone." The students worked under Jesse H. Asusubel of Rockefeller University, a champion of DNA bar coding. They say the project wasn't work. "It didn't feel like a chore. It wasn't time-consuming at all," Stoeckle said. "I'm hoping to get more public interest so it can become cheaper and more common." Asked whether she's less inclined to eat sushi, she said, "I've eaten it, like, 50 times since, so I don't think so."